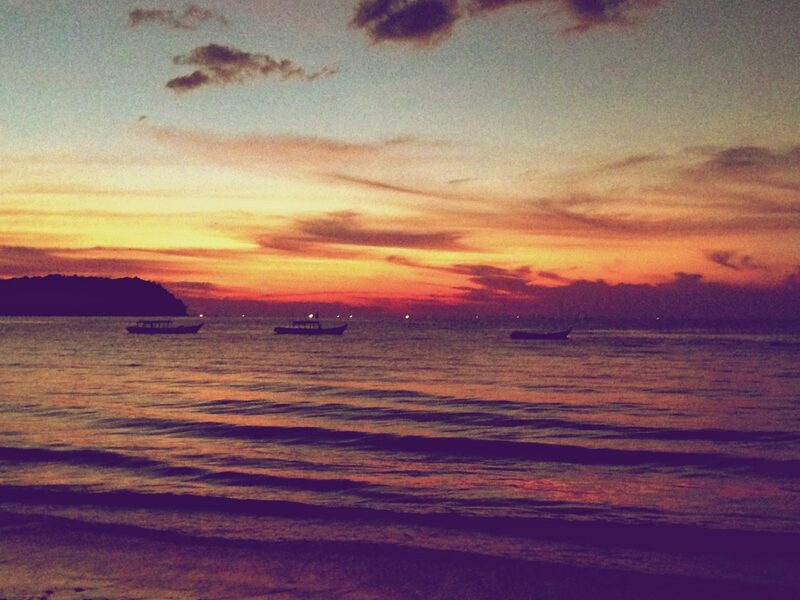 After 33 days of living out of a suitcase and sightseeing nearly everyday, I arrived in Ngapali (pronounced Napoli) Beach where the Bay of Bengal meets the Andaman Sea on Myanmar’s west coast. The calm seawater sparkles like diamonds in the sun and other than a few coves darting from the land, fishing boats and tri-colored stripes of midnight blue, turquoise and topaz water comprise my view. The grains of sand fine, the baby waves roll in and out reminding me I’m at the ocean but tranquil enough to relax. The glass -covered sea extends beyond the horizon and the beach hurries to meet its demands. I play cat and mouse with the tide and when the water catches me and rolls over my feet I’m happy it stopped me as my feet melt deeper into the sinking sand. The cycle of the sun announces sunset and I taste an orange margarita in the cooling warm breeze. For a moment in life, for three days, I am at the beach relaxing and like the fish swimming in the sea; I’m avoiding the capture of nets. Unfortunately for Mr. Snapper, tonight he is mine. My personal chef grilled the snapper before my very eyes on my private beach. Seriously, why do Americans prefer Thailand? My 15-mile beach hasn’t seen a crowd in years. I overindulged on the salads, skipped dessert and made it an early night. Watch what the locals do for they are wise. 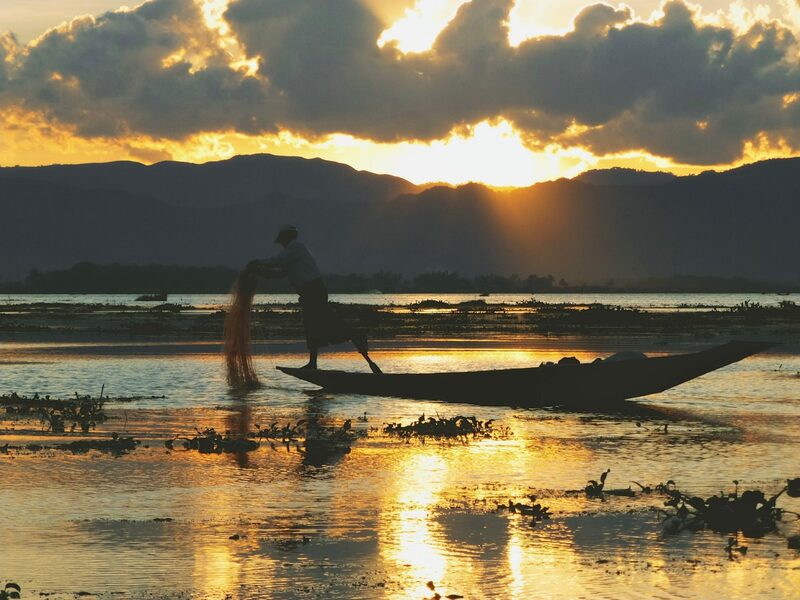 Fishermen in Ngapali hunt their prey at night from sunset to sunrise. They do this because the local stray dogs (and there are many) howl and bark all night and they figured out it’s better to sleep during the day. The dogs screech as if being attacked by wolves and at some stage in the night I wished very deeply that a lone dragon or mythical creature rounded them all up to save me from my misery. If only mosquito nets isolated me from the noise and the bugs. Someone should really look into that invention. When the beasts tired and gave up their vigorous rioting it came time for the monks to start their voluminous praying. I’m curious why they don’t meditate at 3:30 AM when the rest of us are sleeping. I’m absolutely against any religion that needs to call its people to prayer. If they can’t get there on their own, please don’t bring it to the rest of us –so says the Grinch. I confronted the general manager of the hotel shortly after lunch. He inquired upon my check-in to the hotel why so few American visit Myanmar- specifically Ngapali Bech. When I told him I figured out the problem, he replied, “the Wi-Fi.” Um no….The cocktails. At lunch, I ordered a lobster salad, pina colada and water. I received (45 minutes later), a free sweet ice tea twice the size of my pina colada, a bottle of water double the size of the tea and a lobster salad not to mention I mustered some very valuable sun time to walk a whole five minutes to the restaurant after my third attempt to order a pina colada with the beach guy failed. Americans are much too impatient to expend that much energy for anything especially on vacation. They demand timely service and in an overindulgent manner. 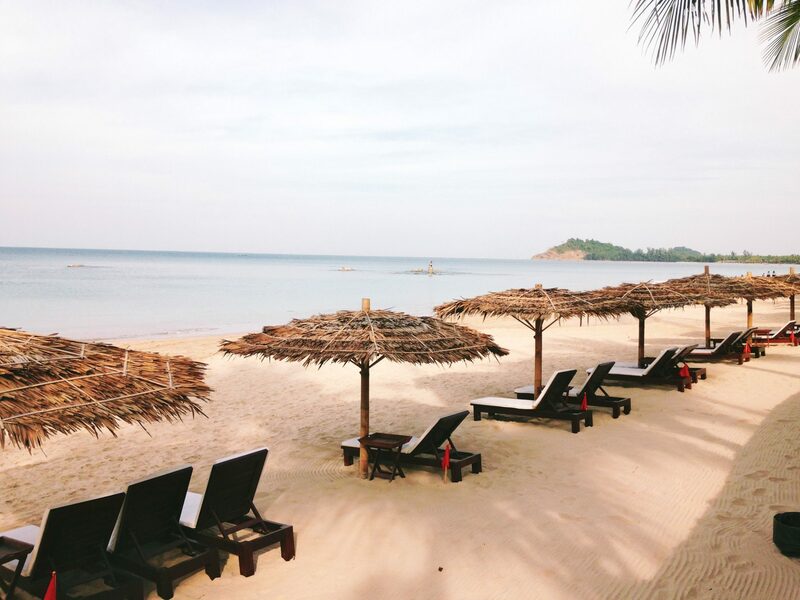 You visit Ngapali beach to experience serenity. A few resorts line the beaches but for the most part it’s a quiet area surrounded by small active fishing villages. It’s a secret to everyone except the Chinese and the Swiss so once the word gets out I fear this sleepy area will be overcrowded. Until then, I plan to take long strolls along the beach at sunrise and sunset, swim in the pleasant, calming, and clear ocean waters, eat papaya, watermelon and fish to my hearts content and struggle through a massage or two. 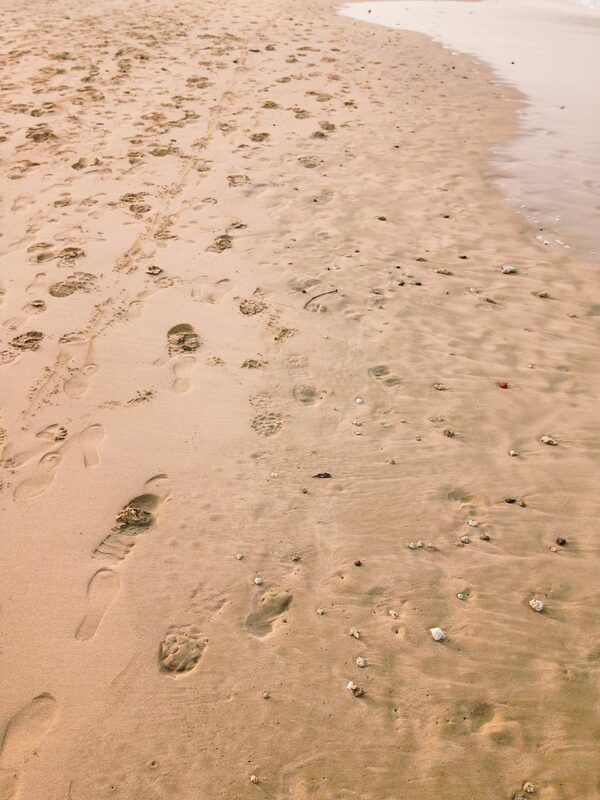 I’m here at the beach with my clearly marked footprints in the sand. I am collecting polished stark white shells and kicking up water in the surf’s sand. I’m resting yet restless. The ocean recycles day in and day out and I’ve watched it churn up the seas bold waters for hours but I want this moment to last to be hypnotized by the sun and the moon and the stars. It will last for three days. I will take it. 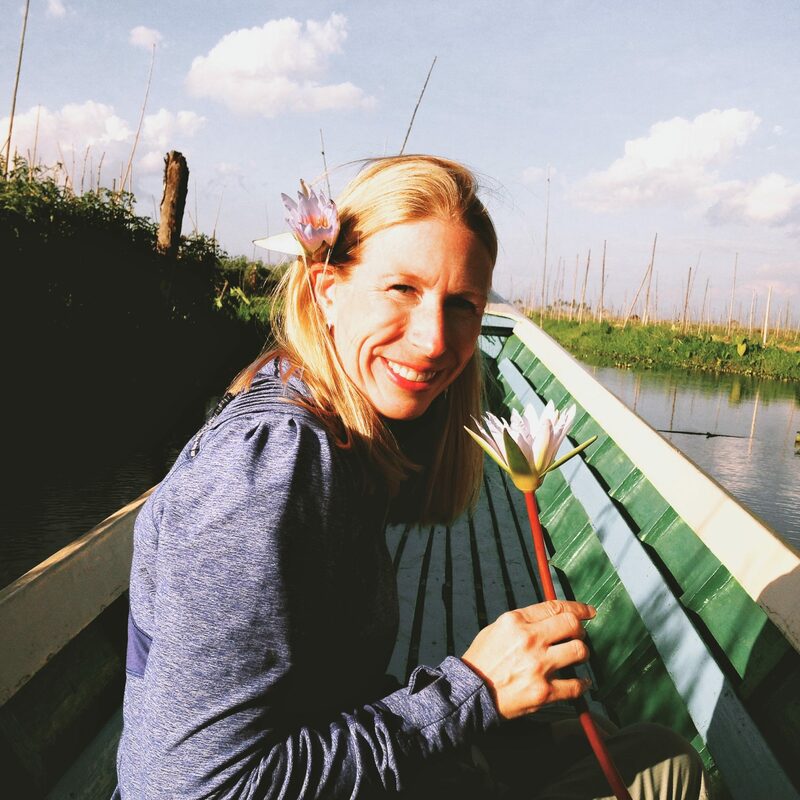 Curious about the wildlife in Lake Inle, I questioned my guide Augie about crocodiles and alligators. He replied nonchalantly, “We definitely don’t have anything scary like that just poisonous fish and snakes.” I see…Nothing to be concerned about except snakes. I only asked because the Chinese tourists sported hot pink and lime green life vests while cruising on the water along with their standard hats and umbrellas. The Chinese do as the Chinese will or they can’t swim. Everyone loves a Lily. I taught my guide about peeling the petals away “he loves me he loves me not’ and he made me a necklace. Today, we raced our way by boat to Padaung village, known as the long neck tribe (Kayan Lahwi) because the women wear brass coils around their necks. The weight of the rings eventually pushes the collarbone down and compresses the rib cage but the rings don’t actually create longer necks. They disfigure women permanently. Padaung is one of the biggest villages on the lake numbering 15,000. The guidebooks beg tourists to refrain from photographing the women and to instead buy their products because the rings are causing so many health problems as women age. It is believed that a long neck is considered a symbol of beauty or wealth. My guide told me that it started in ancient times to prevent tigers from biting them or that possibly the people viewed coiled women as transformed or ugly and therefore competing tribes would reject capturing them. Whatever the reason, I snapped a picture and my guilt overwhelmed me so I also purchased two hand-woven scarves. Several tourists took pictures but turned away from buying. Many Kayan Lahwi now reside in Thailand fleeing in the 80s and 90s as refugees after enduring persecution at the hands of the Burmese military. The collared women in Thailand serve as a tourist attraction and a way for the tribe to remain self-sufficient. Aboard the boat, we visited a few more villages and monasteries. The Ngaphe Chaung Monastery used to be known as the Jumping Cat Monastery. The monk who trained the cats to jump died about 10 years ago and asked that the fats be released so now you encounter a teak constructed monastery with ancient Buddha images, and lots of hungry cats creeping behind the Buddha structures. When we were leaving, I commented on the beautiful flowers at the feet of many of the Buddha images not in this monastery alone but in many of the places I visited. Mistakenly, I assumed all the flowers in the market and in the fields served as home decorations when in fact they grow flowers to provide as an offering to Buddha. Additionally, the hoards of colorful and intricately designed umbrellas that tourists stockpile and use to shade themselves from the sun protect from the elements indeed but in Buddhism practitioners submit umbrellas to Buddha as a sign of protection from suffering and harmful forces. Learn something new everyday. The cat monastery wasn’t my thing but it did provide great views of the floating gardens on the lake. Locals grow vegetables and fruit in large gardens that actually float on the surface of the lake (planted north to south the direction the lake flows). Right now, they are picking tomatoes and gourds and preparing for rice cultivation. They take weeds from the lake, and then pile it with mud also from the lake. The gardens are anchored like vineyards with bamboo poles. They are solid but they float on the water. I made our boat “captain” stand on one to show me how it moves and when he steadied himself on the ground he rocked back and forth like a teeter-totter trying to balance. The local people have utilized the floating garden technique for nearly two hundred years but with the lake’s surface area continually decreasing preservationists recommend it discontinue but in my opinion, the locals live day by day, they aren’t contemplating 20 years from now. Half the drudging machines remain dormant because locals paid off the government people overseeing the lake. We tackled a few more villages on the lake but after visiting Inn Paw Khon Village, a place known for its fantastic quality of silk cloths, I confessed to my guide that I could not be shown any more villages with scarfs, or woven goods. I met a young woman 26-years-old who works eight hours a day cutting lotus plants. Seated with legs crossed, her lap covered with a plastic mat, she cuts small sections of the lotus plant and pulls out a type of slimy string and then wraps it around a board. She did this every few inches of the plant before discarding the stem. With my guide translating, she told me she had been working since age 12. Only the youngest child in most of the lake villages attends school because the rest of the children must work the family trade whether it’s cigars, silks, blacksmith, boats, lacquer etc. This young woman is not married and I discovered the parents arrange for many marriages. It is their duty. One scarf requires the “thread” of 1,000 louts plants. In the summer’s rainy season, the flowers grow tall but now it’s dry and the plants shorter. I couldn’t bring myself to interrogate her further. After visiting the teenage – maybe 20 something women sewing the scarves, I willingly ventured into the village shop and with the eyes of the lotus girl engraved in my memory, I purchased three lotus woven scarves. The lotus plant is said to represent Buddha and serve as a symbol of enlightenment. It grows from the mud to a beautiful spiraling flower. May these scarves bring me vision, compassion, spirituality and clarity like Buddha. I will settle for warmth and cherished memories. We did go on to see a few more villages but I focused my energy on saving my camera and my bladder for the sunset. With my guide and our one-man crew preparing for the ultimate location, I searched for a fisherman with his one-legged abductor row. We moved our boat three times but we finally secured the idyllic spot. The sun descended over the mountains as our fisherman netted his last catch of the day. Like a ball of fire the sun disappeared and the fisherman – our fisherman- seemed to fade into darkness with it. I appreciated sipping a cocktail and watching the sunset from my fancy hotel a few days earlier but on the lake the sky’s light fades to dark quickly, the air turns cool and the lake calms in preparation for a night of laziness. The lake sleeps. I am bewitched. I am content. I am at peace. That is until the birds start chirping, gnawing on my bamboo hut and the cows graze in the pasture outside my room. I finally understand why earplugs were included in the room rate. It’s my last day at Inle Lake. I shall spend it exercising by bike and drinking by glass. The morning fog gave way to blue skies and after I filled my tummy with eggs and a papaya juice I loaded my day bag with toilet paper and sunblock. I promptly took to the back roads and the finest boulevards Inle Lake offers. First, I crushed a hotel best to town at 30 minutes and then found myself searching for a latte and Wi-Fi. The Internet in these parts is a gamble and I wanted desperately to post pictures. I braked at a French cafe thinking surely they would roast up something digestible but sadly I was mistaken and I complained. I departed disappointed without a coffee or Wi-Fi. The clock struck noon. I finished tooling around town and headed to the Red Mountain Estate Vineyard, a collaboration of French and Australian vines planted at the mountain’s edge of Inle Lake. I ordered the tasting for $2. It’s more like a sip of four of their finest but the whites especially the sauvignon blanc deem worthy of my taste buds. The shiraz/tempranillo blend and cabernet sauvignon need a few more seasons on the vine and some modifications. ick! Mindful of my bike and my ability to seek out trouble I parted after my tasting in need of one last avocado shake. I spent the remainder of the day leisurely reading my book and watching the cows move at a snails pace from yard to yard. Occasionally, I spied a farmer peaking his head above the sugar cane stalks but hard at work we never connected. I ended my visit thanking all the staff for their service and generosity. The Burmese really do warm your heart with their smiles.